Our Kickstarter Ends This Saturday! 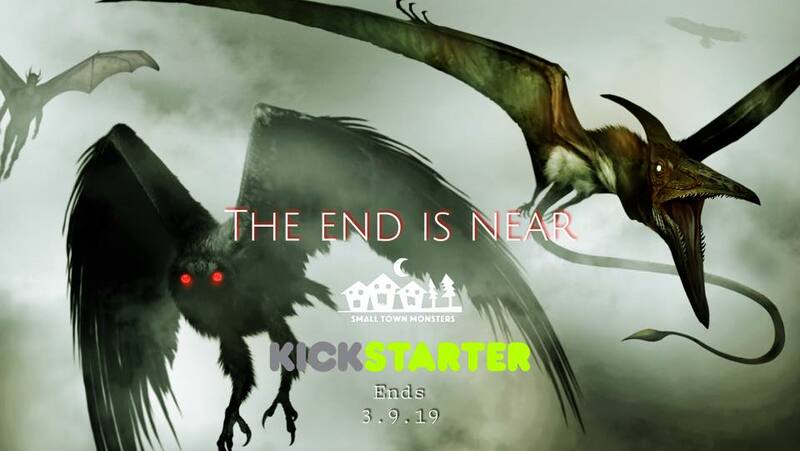 The 2019 Kickstarter to fund the next three monster documentaries from our indie film production company comes to an end this Saturday at 11pm. The campaign was successfully funded in just 15 hours (to the tune of $35,000) and has since raised an additional 53% on top of the initial goal. The funds raised are going toward post production for On the Trail of Bigfoot (out March 29th) Terror in the Skies (June 7th) and MOMO: The Missouri Monster (Halloween). In case you’re new to the Small Town Monsters family, here’s a little background to the campaign: All three projects are directed by Seth Breedlove. Terror in the Skies is a feature film focused on mysterious, winged creatures seen around the state of Illinois. The films finale is entirely focused on the ongoing case of the “Chicago Mothman”; a phenomenon appearing in the news since April of 2017. MOMO: The Missouri Monster focuses on Missouri’s most infamous creature legend which revolves around a supposed Bigfoot-like being that stalked a family in the 1970s. On the Trail of Bigfoot is an episodic, six episode miniseries that was filmed across the US over the course of 2018. The campaign will wrap up this weekend with backers beginning to receive rewards as soon as later this month. This marks the 5th successful campaign for the production company with 2020’s slate of films and Kickstarter already in the planning stages. 2020 marks the 5th anniversary of Small Town Monsters. Rewards include apparel, DVDs, posters and statues, plus film credits. One level also offers the opportunity to appear in the MOMO film in a scene that features Finding Bigfoot alums, Cliff Barackman and James “Bobo” Fay.